When I first came to Nanjing, one of the things that struck me was how nice the sidewalks were. They were wide, lined with large Platanus (Xuánlíng) trees and paved with green and yellow cement tiles. The Platanus trees are related to the Sycamore tree in the US and the Plane tree in Europe. The branches of these white trunk trees reaching out over the street can provide a calming, gentile feeling to a bustling city. I was told by a friend that a “women could walk from one side of Nanjing to the other without a parasol”. 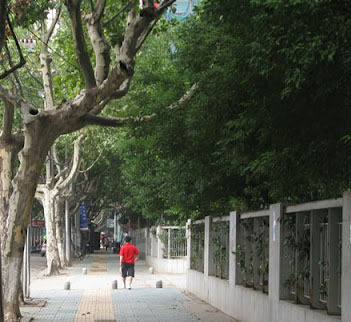 Once a new mayor in Nanjing started cutting down these stately trees, to “modernize” the city. He upset everyone so much, he had to find a new job. Unfortunately some of these trees were removed and transplanted to make way for the construction of a metro line to the suburbs. They were replanted, after the subway was built. The sidewalk tiles are another story. These green squares are about 30 cm (about one foot) in width and have a repeating geometric pattern on them. In the middle of the sidewalk is a yellow line of tiles with raise ovals on them, which provide a guiding right-of-way for the blind. In many places these green pathways are being replaced by sturdier grey bricks, with a red blind right-of-way, which isn’t as colorful or decorative in my opinion as the green tile. But one nice thing about the tiles being replaced is that some of the out lying areas in Nanjing are reusing the green and yellow tiles. Giving the tiles new life. Recycled tile sidewalk patterns, makes walking a simple pleasure. 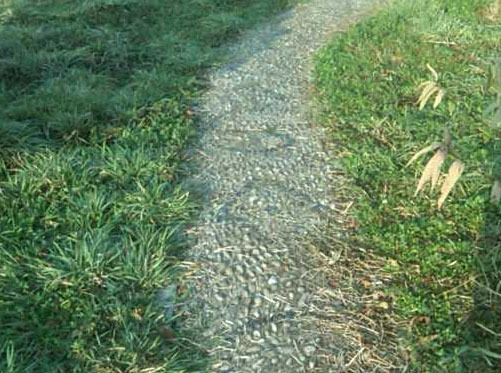 The “new” sidewalks that are created with the recycled tiles can be interesting to follow. When these tiles are placed together they make up a larger pattern. Plus since some of the tiles were broken, this repeating pattern can change to create new patterns. 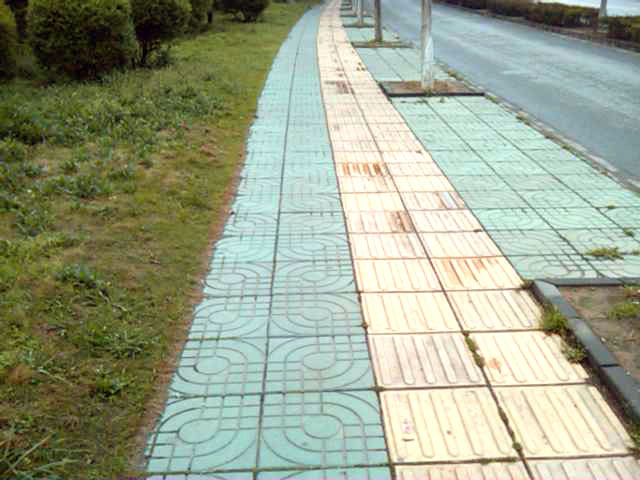 When the blind right-of-way tiles are added it can make for a very colorful and interesting sidewalk. Which makes walking to and from the bus a little more enjoyable.